The GPS module that was used then has still been sleeping in my junk box. When looking through the C code I had written then I found that this could be optimized. I connected the GPS receiver to an AVR ATmega32 microcontroller, added a simple 2-lines-16-characters lcd and started rewriting the software for communicating with the module. The GPS module is connected to the controller via the serial RS232 interface (TxD, RxD, PIN 15 and 14 of the micro). Note that RX of the GPS module must be connected to TxD with the controller and vice versa. The rest of the layout is also very simple. There are various types of data strings transferred by the module, each serving an individual purpose. They are all coded with a leading identifier marked by a $-sign and an identifier code. We will discuss the absolute basic string that delivers essential GPS information, the so-called “GPRMC”-string, where the letters “RMC” represent “recommended minimum sentence”. The various data fields are separated by a comma, please note that the data fields may have various width so just counting bytes is not reliable if you want to “land” in a specific field. Instead the comma separators must be counted. What do the separate data fields mean? The first entry (“191410”) after the “$GPRMC” intro is the UTC time stamp, telling when the recent GPS data set was processed, i. e. the current time in HHMMSS- format. There might be even 10th of seconds then the format is HHMMSSss. Next is a letter (“A” for correct data, “V” (void) if the receiver was not able to get correct data), that indicates if the data is valid and can be used or not. You can use that to discard the data set when the receiver is not able to detect a valid GPS signal. Following a number (here “4735.5634”) together with the subsequent letter (N or S) indicates the latitude of the current position. This is a 100fold decimal value formatted by a decimal separator. Latitude can be in the range from 0 to 90 degrees North or South. Here it is about 47 degrees in the northern hemisphere. Subsequently the same coding is used for transferring longitude data. Longitude is in the range from 0 to 180 degrees East or West with the Prime Meridian in Greenwich as separator. Next two values (0.0 and 0.0) indicate ground speed in knots and bearing in degrees. “181102” is the date stamp (18th Nov 2002). “0.4” and “E” indicate a magnetic declination (degrees and direction) that might occur. “19” is the XOR generated checksum of the string. I found that data transfer is very reliable so I don’t calculate this. //longitude. o1 and o2 are signifier for 'E or 'W' (longitude) resp. a 6 byte buffer (+ 1 byte for “\0” termination) referenced by address for the locator data. The program rolls through the data permanently giving relevant information on the display with changes every second. Due to the fact that I haven’t implemented error handling there might be more or less useles indications when data from the GPS receiver is corrupted or invalid. But mostly the routine works out very fine without any complaint. You can use the ‘A’ or ‘V’ indicator transferred to change the display routine if unvalid data is detected. By the end of this article you can get the full C-code for the project. Thanks for reading! // "RMC" (Recommended Minimum Specific GNSS Data) string. For a transceiver I wanted to design a temperature control for the final amplifier transistors. I have some KTY81-210 temperature sensors here in my junk box. So, one of these should be used. 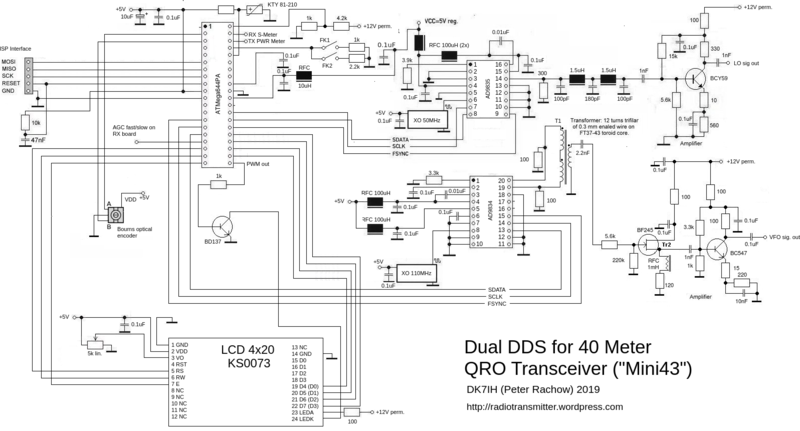 The transceiver again holds digital equipment (AD9951 as VFO and AD9834 as LO) driven by an AVR ATMega32 microcontroller. One of the ADC inputs of this device was designated to process the data delivered by the temp sensor. Some theory in advance: How does a temperature sensor work? The KTY81-210 is a “PTC” element. This to say that electrical resistance increases with temperature. PTCs are mostly made from barium titanate (BaTiO3). This material has an interesting feature: Below the so called “Curie temperature” the material holds an NTC characteristic. Above this point the material changes its behavior and increases resistance sharply and resistance from now on increases with temperature. For the accuracy in a simple temperature measurement for PA transistors this should be sufficient. A simple voltage divider to GND is the best idea to get a voltage depending on the conductivity of the sensor element. One thing should be kept in mind: When current flows through the sensor, the sensor will heat up. If the current is too high this will corrupt your temperature reading. Thus I recommend having Rv > 5 kΩ. AVR microcontrollers have a 10-bit analog digital converter (ADC) operating on the successive approximation principle. The resolution due to the number of bits used is limited to 1024 discrete values (ADC value in the range 0..1023). They can be operated with a reference voltage of either 5V or 2.56V determined by software setup. With this the ADC references an input voltage set to 5V. where Vx is the applied voltage to the ADC input channel, ADC is the figure between 0 and 1023 representing the voltage. 5V / UADC = (Rv + RPTC) / RPTC. R = T * m + R0. (m is the slope factor (gradient), T0 is the constant term, in this case the PTC’s resistance at 0°C). (R – R0) / m = T.
That means that the PTC element equals a change in resistance by 1Ω when the temperature changes by 0.0567K. Rv of the voltage divider in this case is set to 5100Ω. For other values please change value in the definitions section. get_adc(4) is the function to get an ADC reading (see above! ), in this case the voltage divider is connected to ADC4 input. By the way: The functions returns a 10 fold value because in the reading I add a decimal to get one tenth resolution. When I built the semi automatic tuner two years ago I did not take into account some possible shortcomings the device could suffer from. The first of these I noticed when I exceeded power levels of about more or less than 50 watts. In some cases there was rf incoupling leading the microcontroller to fail so that the relay setting was invalid for the given combination of frequency and antenna. The next point was that the algorithm to set the capacitor was far from being optimized. And, as I found out, the maximum inductance I had inlcuded was far too high. On the other hand the lowest indcutance was to big to ensure very fine tuning. So this was revised, too by stepping the inductors more carefully. The consequence then was a complete reconstruction of the tuner trying to avoid the problems from rf stray energy being coupled into the microcontroller and improving the software and hardware. Thsi article describes a microcontroller driven semi-automatic antenna tuner capable of handling power levels up to 150 watts. 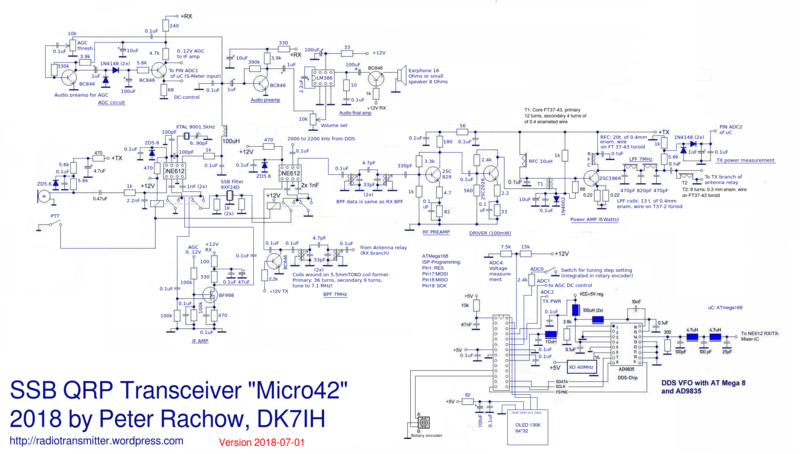 The device is a low pass filter tuner manually tuned by setting the optimized L/C combination by hand and then storing the values into the EEPROM of the mictrocontroller to recall them later (seperately for each band from 80 to 10 meters including WARC bands). The tuner ist designed to couple long wire antennas (i. e. longer than half a wavelength) in the frequency range from about 3 MHz to 30 MHz. The antennas can be balanced or non-balanced. The device uses 7 coils wound on iron powder toroids and a variable capacitor controlled by a motor with a reduction drive and a a device that detects the current turning angle of the rotator. Also integrated you will find a measurement section to give the current standing wave ratio and put out this on the display. The RF unit containing the tuning coils and the variable capacitor. Starting on the left side, you see the microcontroller unit equipped with an 8-bit AVR microcontroller (ATMega16 or similar). The user interface is very simple and made of 6 push buttons. These are connected to GND via switchable individual resistors leading to the ADC3 input of the cntroller. The pull up resistor for ADC3 is activated thus forming a voltage divider and thus an individual ADC value for each push button to be recognized by the software. This is done because it saves control lines and controller ports to a wide extent. The LCD is a two line 16 characters LCD. Output ports are connected to ULN2003 driver ICs. These ICs contain a driver capable to handle up to 30V DC including a clamp diode so this IC can drive mtors and relays directly. There are capacitors of 0.1uF connected to the port lines to minimize rf coupling effects. Wire gauge is 0.4mm. The inductors are shortened by a 12V relay each if neccessary. So you can (by binary calculation) set any value from 0.1 uH to close to 16uH. 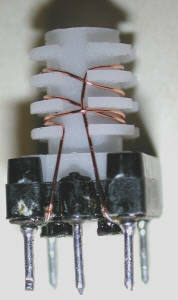 An output transformer is used to give a balanced out for e. g. doublet antenns. It is 10 turns bifilar on a 2.5 cm toroid ferrite core of No. 43 material. If you use a non-balanced antenna you can leave out this transformer. The capacitor in my construction is a 200pF max. butterfly capacitor with air as dielectric. The advantage of a butterfly type is that it needs only 90° angle to turn it from minimum to maximum capacity. The motor (a 5V dc version) is connected via a 240:1 gear drive by TAMIYA. The motor is pulse driven so it can be directly connected to 12 Volts with running danger to damage it. The drive has two outlets providing one axle at each side of the drive. To one of the axles I connected the capacitor, the other one connects to a potentiometer to report the current swing angle to the microcontroller. This allows precise feedback of the capacitor’s current position which is essential for setting it to the desired value. The value of this variable resistor does not really matter since it is only a simple voltage divider. Anything between 1k and 10k should fit. Make sure that you use a piece that is easy to turn to minimize friction. To connect the axles I used PVC tubing with an inside diameter of 3 mm. Also included is a measurement section to give the user a current reading of VSWR. The coupler can be anything you should regard as proper. I used a strip power coupler from an old CB radio. But other systems should also work. The RF board is mounted to the bottom of the case, here with dismantled controller board. The controller board is sited on top of the package. On the right side there is the variable butterfly capacitor, on the board, centered you can see the motor plus the reduction drive. On the left side of this there is a small potentiometer that forms the turning angele detector. To connect this to the ADC of the controller it is highly recommended to use shielded cable! //Auslösung des Overflow alle Sekunde sec. TIMSK = (1<<TOIE1);   // overflow aktivieren.